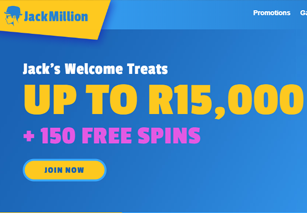 Jack Million Casino is a fresh new name on the online gaming scene, and while launched very recently, it gets to benefit from the experience of its Majestic Slots sister which has been operating since 2014. The new casino is not only multilingual, but it also offers a couple of tailored sites. The South African one is sure to make you feel more than welcome by providing the opportunity to pay and play using ZAR. Powered by RTG, a developer with more than 20 years of experience within the gambling industry, Jack Million will offer every possible way to access their games. Players can choose between instant play and download version, or enjoy their favourite form of online entertainment on the go using one of the supported mobile devices. The Casino is licensed and regulated by the Government of Curacao, so you can be sure they have implemented all of the necessary measures to protect all sensitive information transferred over the Internet, and ensure the games you play deliver random outcomes. Play Jack Million Mobile Casino From Your Mobile or Smartphone in Rand. Thanks to the fact that Realtime Gaming makes their products available both in download and no-download version, you'll get to choose whichever is more to your taste and benefit from an equally enjoyable experience. While you'll have to register before launching a game, free-play option is available to test them without having to stake real cash. The gaming catalogue currently counts close to 100 slots, many of which feature a progressive jackpot. The most generous ones currently display a combined jackpot value of about 10 million Rand. If you enjoy spinning the reels to win prizes, let us assure you you'll genuinely struggle to find any of the most popular or newly released RTG titles missing. Players who are not into slots should check out an extremely generous video pokers section offering more than 60 variants to choose from. A smaller selection of table games includes several Blackjack, Poker and Roulette variants, as well as Rummy and Sic Bo. Several other ongoing promotions offer an opportunity to get more playtime than your cash would normally buy. Show up and make a deposit on a Saturday and/or Sunday, and the first two will receive a boost of 50% each. In case you've been unlucky and lost some money while playing at Jack Million, the operator will do their best to make things better by offering to refund 10% of your losses on the following Monday. The Casino will reward you for each R10 of real cash wagered by allocating 1 Comp Point. Once you've accumulated a certain amount, they will offer to convert it back to cash. You might want to check out the game of the month as it delivers valuable points three times as fast. New players automatically receive the status of Silver member and can move to VIP and VIP Elite levels once they have piled up a certain amount of Comp Points and deposited a specified minimum value. The higher you go, the faster you'll earn cash-redeemable points, benefit from larger cashback offers, and enjoy faster withdrawals. Choosing among Visa, MasterCard, Skrill, Neteller, ecoPayz, Paysafe card and Bitcoin, South African players are able to make their deposits in ZAR. The same currency is available to cash out their winnings using CFT, Skrill, Neteller, ecoPayz, Paysafe card or Wire Transfer. The online gaming scene is already very busy and highly competitive, and it's not easy for the newcomers to find their place under the sun. Jack Million Casino, however, stands a good chance to make it to your list of favourite gaming destination. They've chosen one of the biggest suppliers to stock their games library, and have implemented a good promotional portfolio to motivate players to sign up and visit on regular basis.